Sir Edwin Landseer forever changed what a portrait of a dog could be, painting the companions of royalty, working dogs and the everyday dog on the streets of London. This course takes the rich character of those Landseer portraits as inspiration, as well as a wide range of works which approach to the animal is as a subject, including contemporary watercolours of the animal. Demonstrations will address specific aspects of the animal portrait in detail: painting the expressive eye will be demonstrated in a step-by-step approach with a peacock or a horse's eye as subject, and other presentations will cover translating texture, and the challenges of a wide variety of animal anatomy. Reference is provided for all exercises in class, drawn from across the animal kingdom. 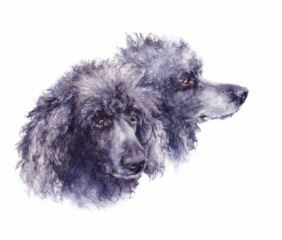 As time allows, the class will explore the full scope of the watercolour medium as relates to the animal portrait: dry brush textures, underpainting for definition of form, enriching flat colour, conserving whites, iridescence and colour mixing. Handouts will be available detailing demonstrations and exercises. Martha Robinson holds a BDes (Bachelor of Design) in Illustration from OCAD University, and her background includes a practice in illustration and textile design, as well as solo exhibitions in public and private galleries and juried shows. Her working career as an illustrator demanded a facility with a variety of media and subjects. She now paints primarily in watercolour, and sometimes in oil for exhibition. Martha received her MA in Contemporary Art (CADN) from OCAD University, and is presently a candidate in the Interuniversity Doctoral Programme in Art History at Concordia University. In addition to the subject of her dissertation, the representation of birds in contemporary art, her research interests include natural history, the history of watercolour, mid-century modernism and landscape painting.